The Scheldt (/ʃɛlt/, French: l'Escaut [ɛsko], Walloon: Escô, Dutch: Schelde [ˈsxɛldə]) is a 350-kilometre (220 mi) long river in northern France, western Belgium and the southwestern part of the Netherlands. Its name is derived from an adjective corresponding to Old English sceald "shallow", Modern English shoal, Low German schol, Frisian skol, and Swedish (obsolete) skäll "thin". Originally there were two branches from that point: the Oosterschelde (Eastern Scheldt) and the Westerschelde (Western Scheldt) but in the 19th century the river was cut off from its eastern (actually: northern) branch by a dyke that connects Zuid-Beveland with the mainland (North Brabant). Today the river therefore continues into the Westerschelde estuary only, passing Terneuzen to reach the North Sea between Breskens in Zeeuws-Vlaanderen and Vlissingen (Flushing) on Walcheren. 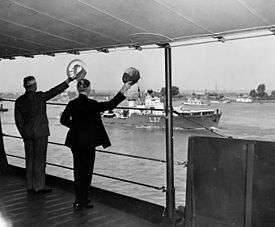 The Scheldt is an important waterway, and has been made navigable from its mouth up to Cambrai. 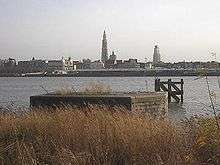 The port of Antwerp, the second largest in Europe, lies on its banks. Several canals (including the Albert Canal) connect the Scheldt with the basins of the Rhine, Meuse and Seine, and with the industrial areas around Brussels, Liège, Lille, Dunkirk and Mons. This status quo remained intact—at least on paper—until 1528, although by then both the County of Flanders on the western bank and Zeeland and the Duchy of Brabant on the east were part of the Habsburg possessions of the Seventeen Provinces. Antwerp was the most prominent harbour in Western Europe. After this city fell back under Spanish control in 1585, the Dutch Republic took control of Zeeuws-Vlaanderen, a strip of land on the left bank, and closed the Scheldt for shipping. 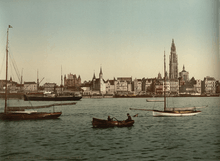 This shifted the trade to the ports of Amsterdam and Middelburg and seriously crippled Antwerp—an important and traumatic element in the history of relations between the Netherlands and what was to become Belgium. ↑ "VNSC Communicatie : vraagbaak voor alles op, rond en in de Schelde" (in Dutch). Retrieved 2014-06-03. ↑ Prothero, G W (1920). Question of the Scheldt. Peace handbooks. London: H.M. Stationery Office. Retrieved 2014-06-03. "Scheldt". Collier's New Encyclopedia. 1921. "Scheldt". Encyclopædia Britannica (11th ed.). 1911. "Scheldt". The Nuttall Encyclopædia. 1907.